We’re loving GitLab CI because it’s so easy to get your work done with perfectly configured CI and CD pipelines while staying focused on the software product development itself. For an efficient development and deployment workflow it is mandatory to have automated build and test pipelines in place which helps you to automate and secure all the boring stuff and this speeds up your dev and test cycles tremendously. This being said, in this post we’re going to describe a complete guide how to install and run a GitLab CI infrastructure the Docker way. For this two part tutorial we’re going to install a complete GitLab CI server as a VM (virtual machine) using Oracle VirtualBox on macOS. 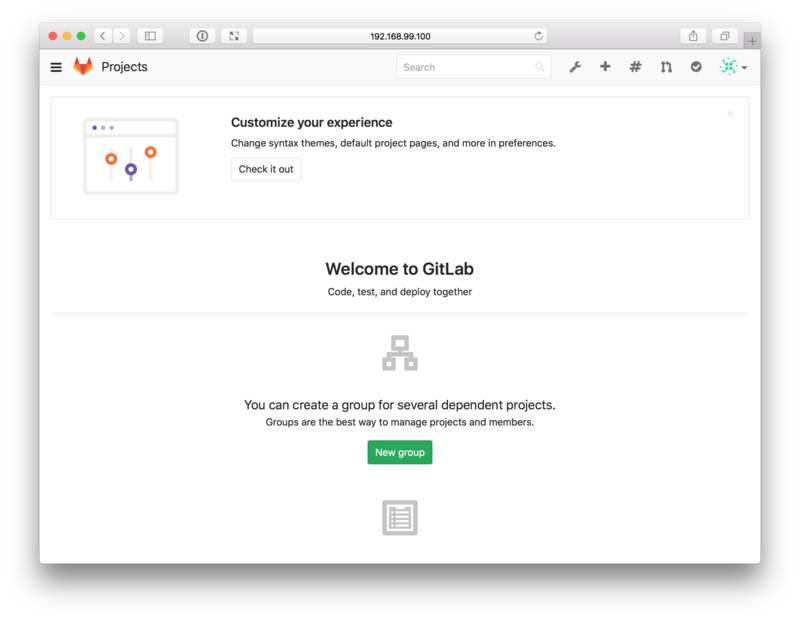 Part 1 covers the basic installation of GitLab CI and part 2 will go deeper into the configuration and usage of GitLab. These are the typical technical requirements we need to run a GitLab CI server on a Linux machine for a small workgroup. As you can see, you can even grow your team up to 100 users while still using the same system setup. Just grab the .dmg installer directly from https://www.virtualbox.org and follow the instructions to install VirtualBox v5.1.22 on your Mac. You can follow the official instructions from Docker for installing Docker Machine from https://docs.docker.com/machine/install-machine/ or you can just use Homebrew to install and update it even easier on macOS. With the latest versions of VirtualBox and Docker Machine installed on your Mac you’re already prepared to go ahead and deploy a complete Docker host running in a local VM with a single command only. First, we’ll create a VirtualBox VM with the help of Docker Machine. Once the docker-machine tool is installed on your Mac, you can easily create a new VM with a running Docker Engine with a single command only. Because docker-machine defaults to a machine driver for VirtualBox, we can omit the -d virtualbox or --driver virtualbox option. As we’d like to define 2x CPU’s and 4 GByte of memory for our VirtualBox VM, we have to use the appropriate options --virtualbox-cpu-count 2 and --virtualbox-memory 4096. With the last parameter we can define the name gitlab for our Docker Machine, so it’s easier for us to use it later on. Within only a few minutes, we should have a new Linux VM running, which is already equipped with the latest Docker Engine. So let’s check this out in more details. We can also login into this VM and check the Linux system locally if it fits our needs. …and 2x CPUs as we had requested. Now, we’re able to use the Docker Engine directly from our Mac’s terminal app. With the command docker-machine env <machine-name> we’ll get all the necessary parameters to connect our Docker Client to the Docker Engine in the VM. Connecting the Docker Client to our Docker host with the following command to set the environment variables. This points the Docker Client directly to our Docker Engine running in the VirtualBox VM. As you can see, it’s really easy to remote control a Docker Engine which is running in a VM or even in a cloud server far away from us. Checking the version of the Docker Engine. With this little preparation we do now have a complete Linux Docker host running within a VirtualBox VM on our Mac. The Docker host is based upon Boot2Docker 17.05.0-ce, with a recent LTS Linux kernel 4.4.66 and the very latest Docker Engine 17.05.0-ce. “ce” stands for “Cummunity Edition” which is the freely available Docker Engine. If you may like, you could also use a Docker for Mac (D4M) installation on macOS, which is currently based upon Docker Engine 17.03.1-ce (stable channel) and 17.05.0-ce (edge channel) as of time of writing this article. As we’re going to use Docker Compose to configure and deploy the GitLab CI server on our Docker host, we can describe the complete setup within a single configuration file in YAML format, the docker-compose.yml file. We’d like to have some of our local configuration options outside of the docker-compose.yml file and therefore creating a .env file with all the environment variables we need. Docker Compose reads the .env file automatically and uses the content to populate the variables in the docker-compose.yml file. Before we start the application stack, it’s always a good idea to check the Docker Compose configuration file first with the command docker-compose config. If everything wents fine and we don’t have any syntax errors in our YAML file, we’ll get a clean output without any errors. All variables should be replaced and we could easily check this visually. With all the checks passed successfully we can now start the complete GitLab CI application stack we’ve previously defined within the Docker Compose YAML file. And this can be done with a single easy command, too. BTW, that’s exactly the same with Docker Compose every time - no matter how simple or how complex your actual application stack looks like! After a few minutes all the referenced Docker images got pulled from the Docker Hub and all the services we’ve defined in the docker-compose.yml file should be started. At the end the complete GitLab CI server should be up and running. But before we’re going to login into the GitLab CI web interface the very first time, we should check the application stack with some simple Docker Compose commands. With docker-compose ps we can list all the running services, checking their states and see what network ports they are exposing. As you can clearly see from the above output, all the three services (gitlab, postgresql and redis) are up and running. We can also see, that the gitlab service exposes two public network ports - 10022/tcp for SSH access and 10080/tcp for the GitLab CI web interface. In case of trouble we could also check the log files which can be easily accessed with the command docker-compose logs. 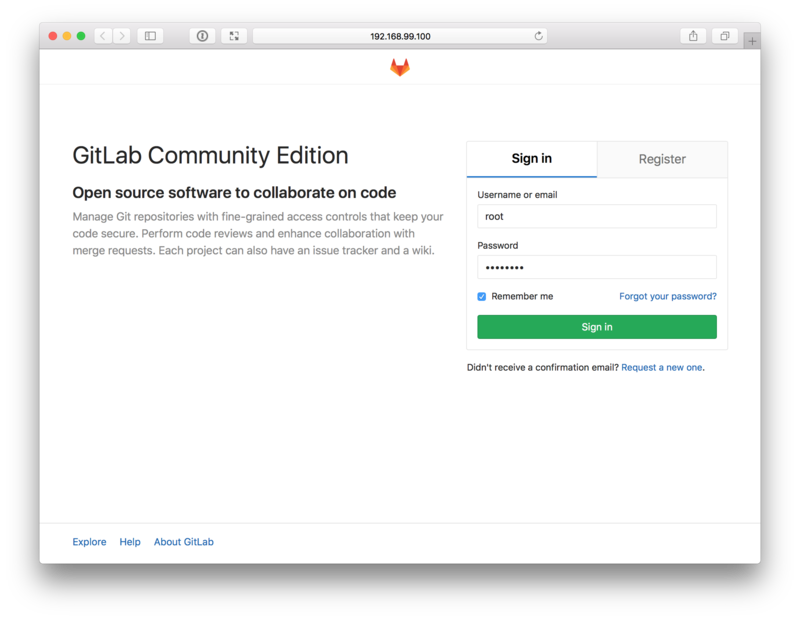 Now, we can open the web UI of the running GitLab CI server. 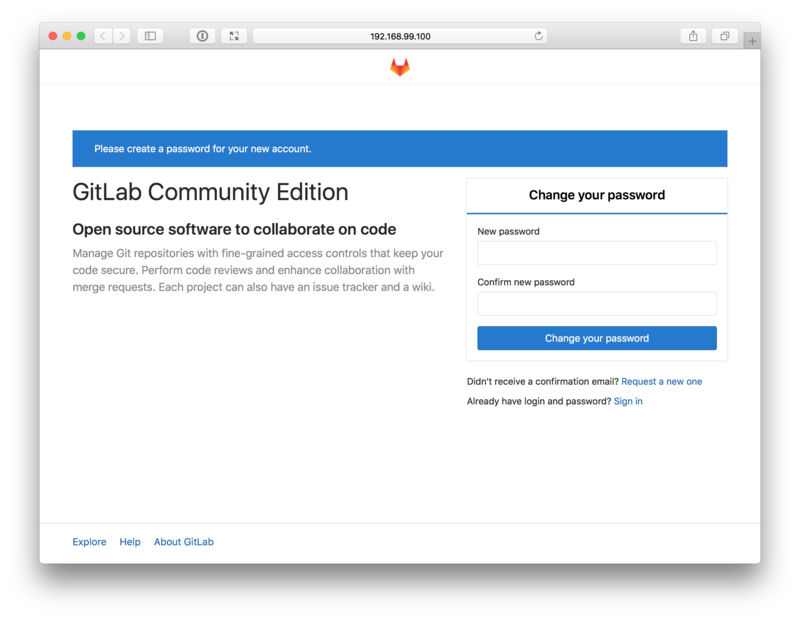 In this first login screen you have to set the root password of the GitLab CI server. and get instant access to the GitLab CI server as a primary administrator. In order to start a complete GitLab CI server, we just need a running Docker host, a docker-compose.yml file which defines all needed services and an additional .env file containing some environment variables. That’s really basically all we need! With a single command docker-compose up -d we can start the complete GitLab CI server.